Recently, research on Italian Fascism has adopted a new approach, as scholars have been more focused on finding links between the dictatorship and its foreign policy than on exploring connections between Fascism and its domestic policy. The attention has mainly been focused on two topics: the propaganda influencing Italian communities living abroad, and the propaganda influencing foreign public opinion. Although many books on specific countries have been written – for example on the USA by Guido Tintori and Stefano Luconi – remarkably there has not been much attention paid to the UK, apart from valuable contributions from Claudia Baldoli and Roberta Suzi Valli. Great Britain is one of the countries which had a significant impact on the history of Fascist Italy: in the 1920s, Great Britain was an ally to Italy; and in the 1930s, Italy strived hard to gain the recognition of Great Britain in the League of Nations, as the latterwas a prominent and influential member. Mussolini was aware of the need to develop and, for as long as possible, to improve Anglo-Italian relations in the second half of the 1930s. Even in the greatly changed international picture following the Abyssinian War, the dictator tried the path of diplomacy by signing the Gentlemen’s and the Easter Agreements with Great Britain. Awareness of the country’s political relevance was crucial for the development of propaganda in the UK both in the 1920s and 1930s. Italian propaganda in the UK started from the time of the March on Rome and the very beginnings of Mussolini’s government up to the outbreak of the Second World War. An interesting sign of the dictator’s focus on the country might be seen in the editorial history of Dux, Mussolini’s most important biography. Written by Margherita Sarfatti, the Duce’s mistress and adviser in the 1920s – as Richard Lamb has pointed out – the book was published in London in 1925 under the title of The life of Benito Mussolini and then published in Italy one year later. As recent books such as Il fascismo e gli italiani all’estero by Marco Pretelli widely show, an important propaganda tool used by the dictator was the diffusion of the Italian language and Italian culture abroad. As the many letters sent to the Italian Embassy from Italian politicians in Great Britain demonstrate, Italian cultural and linguistic expansionism in the UK encountered a number of difficulties. For example, from a British point of view, Italian was not seen as a language that would be useful in a commercial or business context, but rather it was seen as a language for a few select intellectual elites. Consequently, the Italian language found a more supportive environment in British universities than in places such as secondary schools, which were interested in helping pupils to find jobs. A few records show that the Fascist government was well aware of such limitations and that it focused its attention on British universities by creating new Italian chairs in cities such as Leeds and Cardiff, and financially supported the expansion of Italian departments that had already been founded in the UK. The links with British universities increased at the beginning of the 1930s, when events such as the regime’s “Decennale” – the 1932 Exhibition of the Fascist Revolution – gave relevant input to the propaganda. Before fascism, teaching of the Italian language had not been used for propaganda purposes. The only Italian chair was at University College London (UCL), which had been founded in the first half of the 19th century. Eric Vincent, an English professor of Italian, has shown that other chairs were founded after the Great War in Oxford, Cambridge and Birmingham by Italian intellectuals, such as Arturo Serena and Antonio Cippico. Italian chairs in Glasgow and Cardiff were founded in 1924 thanks to a very rich business man from Glasgow, Daniel Stevenson. As far as we know from archive sources, Stevenson politically supported Italian Fascism and Mussolini, even personally writing letters to the dictator. The focus on universities in Great Britain was stronger compared to the focus on the universities of other foreign countries. Such an approach was borne out of circumstances specific to the UK, in particular the failure of the Fascist Group of Italian University (GUF), a youth organisation exported abroad from 1932, to establish itself in the universities of the UK, as it had done elsewhere. Part of the linguistic and cultural expansionist policy of the 1930s was the considerable effort made by the Fascist government to influence the political activity of Italian professors working in England. For instance, they were delegated to collaborate with numerous political and cultural institutions like the Fasci in the UK, the British Italian League, the Friends of Italy, and the British version of the Società Dante Alighieri, the Anglo Italian Literary Society. Italian professors were also strongly encouraged to promote the teaching of Italian in British secondary schools, as well asto personally meet politicians, both in England and in Italy, such as Dino Grandi who was ambassador in London from 1932 to 1939. The most influential of Italy’s propaganda ministers in the UK was Camillo Pellizzi. As we will shortly see, Pellizzi’s activity in England included different kinds of activities from collaboration with Italian newspapers to lecturing. Camillo Pellizzi lived in London from 1920 to 1939 and was employed at UCL, first as a lecturer, then as a reader and finally as a professor. Fascist propaganda at UCL had more success than at other universities like Oxford and Cambridge due to the number of other Fascist professors that worked there, including Antonio Cippico and Endmond Gardner, both of whom were close friends of Pellizzi. It is also worth mentioning the location of the university in London, where the first and major Fascio in the UK was established and, as already mentioned, specific situation of UCL in being the only university where the teaching of Italian language and culture was established before the cultural expansionism developed by Fascism mainly in the 1930s. Pellizzi was also president of the Anglo Italian Literary Society andLondon correspondent for Mussolini’s newspaper Il popolo d’Italia. Moreover, alongside men such as Antonio Cippico, he played a remarkable role in creating the Italian Fasci in the UK, including the one in London. 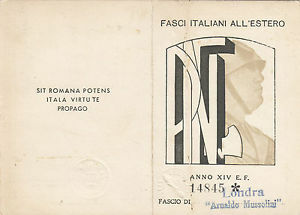 He was particularly interested in forging links with English Fascists, evidenced by his relations with Fascists such as the founder of the Imperial Fascist League (IFL), Arnold Leese, the catholic Henry Hughes and Herald Goad, director of the British Institute in Florence from 1923 to 1939. Working alongside Pellizzi were professors such as Cesare Foligno and Piero Rèbora.Foligno was employed as a professor at Oxford from 1909 to 1940. Grandi and Pellizzi thought that Foligno was the best minister of propaganda in England; however, in order to make more of a noticeable impact, Foligno joined the Italian Fascio in London in 1932. His main activities comprised the translation of Italian books and research into connections between Italian and English culture. A relevant example is his work on Ugo Foscolo, mainly regarding the years in which Foscolo was living in London. Piero Rèbora was very successful at spreading propaganda in the UK as well. He was employed at the University of Manchester and was very active in writing for English newspapers such as the Observer against anti-fascist English articles published in the socialist Manchester Guardian. Vastly different from men such as Pellizzi, Foligno and Rèbora were intellectuals like Mario Praz. Despite his strong interest in contemporary international culture, Praz did not have any interest in politics, as he acknowledged in his autobiographical book: La casa della vita (The House of Life). Additionally, Praz’s personal papers show that he had a close friendship with Ian Greenless, who played a remarkable role in confronting anti-British propaganda in Fascist Italy. We have seen that, in the 1930s, the diffusion of the Italian language abroad was used as propaganda, a policy which had not been seen before Fascism. Nevertheless, Mussolini did not achieve his desired goal through this policy. The research I have undertaken as a PhD student at the University of Readingshows that the activity played by intellectuals such as Camillo Pellizzi, Cesare Foligno, Piero Rèbora and Mario Praz had an impact on only a minority of intellectuals. The failure of the professors of Italian was due to several cultural and political causes. On one hand, we should mention the British interest in supporting languages more useful on a commercial and practical English point of view such as Spanish, and German. On the other hand, Communism was widely spread among professors and students in British universities – and this stifled the Fascist propaganda of the Italian professors. I am currently exploring this interesting and almost unexplored topic in an article based on primary sources mainly collected at the Special Collections of the Oxford Bodleian Library. Claudia Baldoli, Exporting fascism. Italian fascists and Britain’s Italians in the 1930s (Oxford and New York:Berg, 2003); Roberta Suzi Valli, ‘Il Fascio italiano a Londra. L’attività politica di Camillo Pellizzi’, Storia Contemporanea 26, no. 6 (1995): 957-1001; Tamara Colacicco, L’emigrazione intellettuale italiana in Gran Bretagna: i docenti universitari di italianistica tra fascismo e antifascismo 1921-1939 (forthcoming). Matteo Pretelli, Il fascismo e gli italiani all’estero (Bologna: Clueb, 2010). T. Colacicco, ‘Strade e volti della propaganda fascista: la diffusione dell’italiano in Gran Bretagna 1921-1940’,PhD diss., University of Reading. T. Colacicco (in progress) The GUF’s experience in England in the 1930s: the involvement of Dino Grandi, Giuseppe Bottai and Cesare Foligno. Tamara Colacicco is a PhD candidate at the University of Reading. Her research interests include Italian emigration to England, political use of Italian culture in the UK, and views of Italians from London. She has written for The Italianist (‘L’emigrazione intellettuale italiana in Gran Bretagna: i docenti universitari di italianistica tra fascismo e antifascismo 1921-1939’, forthcoming, 2015), and is also a novelist (Pecore bianche e pecore nere: racconto di una conversione laica, Rome, il mio libro, 2014; Scoprii una notte la luna, forthcoming, 2015). Her books are often a narrative face of the topics explored academically. In particular, Scoprii una notte la luna reflects on experiences such as the mysterious relationship between writer and inspirations, and emigration to the UK. Danielle Hipkins, “‘Whore-ocracy’: Show girls, the beauty trade-off, and mainstream oppositional discourse in contemporary Italy,” Italian Studies 66 (2011): 413-430. Emma Renold and Jessica Ringrose, ‘Teen girls, working class femininity and resistance: Re-theorizing fantasy and desire in educational contexts of heterosexualized violence’, International Journal of Inclusive Education 16 (2012): 461-477 (465). This entry was posted on April 29, 2014 by readingitaly in Critic's corner.